I am not sure what drew me to do reading 3 Near Death Experience (NDE) books in the past 30 days, but I eagerly did. In some ways it is not a surprise as I’ve had a strong interest in this area for over 20 years. Perhaps my interest started in high school as I yearned for a spiritual experience of my own. Going to Heaven and returning to tell the tale, what feat is better than that? I didn’t want to die, but I wanted to meet with God or at least receive special insight into what this whole life thing is all about! What could be more exciting than that?! Yet, without a special invite or a guaranteed ticket back I settled for the next best thing… reading the stories of others who have themselves been in God’s presence. The first book I read while I was in college. It was Life After Life by Raymond Moody. Over time, I continued to read additional books after that, eagerly grabbing the titles up as they crossed my path. Authors such as Elizabeth Kubler-Ross continued to feed my mind with the reality of a reality beyond the confines of this lifetime. 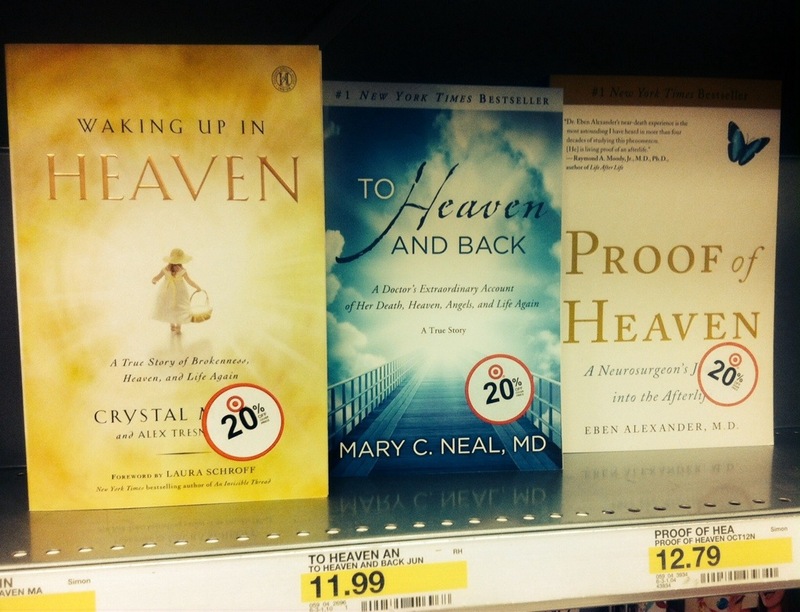 This past month the three books I read were all displayed next to each other on display at my local Target store: Waking Up In Heaven by Crystal McVea, To Heaven and Back by Dr. Mary C. Neal and Proof of Heaven by Dr. Eben Alexander III. I didn’t buy them all at the same time, but knew right away that I’d likely purchase them all… and although I could have saved a buck or two by buying them for my Kindle, I knew that I was going to want the actual books: to read the words on paper, turn the pages, write and highlight on the passages and paragraphs and to be able to pass the book on to who might need it next. I just knew: buy these books. I purchased them and read them in the order I saw them on the shelves. In a unexplained way they each built upon each other… one after the other…. perfectly completing my desire for more details, further explanations, and spiritual insight. I have no doubt been changed by these books on a soul level, but trying to put how into words that have meaning is proving difficult and frustrating. Perhaps over time I will become more aware of how I’ve been affected by experiencing life after death through the words written and shared by these three unique individuals. While reading these three books I was reminded of the similarity in experiences of others in previous books I’d read concerning those who’d died and returned. Pretty much all who die see a Light. In fact, they don’t just see a light: they feel, hear, taste and touch it will all the senses that they have here on Earth… plus some senses that we have yet to experience or even understand. Everyone who returns describe how dificult it is to explain this Light with the words and analogies of this world. All attempts to describe it fall short and pale in complarison to the REAL-deal. Fortunately, this does not keep these folks from trying their best to let us know what the Light is like. All come to the conculsion or realization that this Light is God.… and all God radiates is pure Love. Upon returning to Earth, all seem to agree Love is the most important thing: Loving ALL and judging no one. They each try to then live their lives to better share this Love. Each of them, it seems, had a purpose, each “missions” to accomplish, and we do as well. We each have those specifically assigned to us to love or to share our love with. Sometimes those who pass and come back realize it is their family, others it isn’t specific or clear, but they understand it is all about the letting go of fear, and embracing love. One thing is clear: It is all about the Love. Well, I have not read anything that conflicts that possibility, but I have to admit that I am a little attached to my individuality and like the idea of keeping myself separate but connected. I have been in that light..no its not others who have passed on..it is the Light of Christ and it is pure love and it is liquid yet not..it goes through you yet you are not solid…and because of the love their is so much peace..peace everlasting and because of all this..there is sheer pure joy..oh what joy..joy joy joy..pure joy. I SO appreciate the insight from one who has “seen the Light”! What a treasure! What a pleasure! It seems the more answers the more questions I have! Yet I read (and read, and read…) that my questions WILL be answered as instantaneously as they are asked… If they are asked. I’d love to hear more of your experience! (But that should be of no surprise, ha!) Have you shared it before? Deep sigh…. How amazing! I waas asking God to give me a revelation of the righteousness of Christ…being in Him…we are the Righteousness of God in Christ Jesus.. When we accept Him we are immersed in Him..one with Him.,..it is no longer we who live but Christ who lives in us. According to God’s record.. He sees only His Son..the Light of Christ..we must look through His eyes. That’s a lot to digest and take in… not sure my earth-mind gets it but I do think it makes sense in my heart & soul. So… Light and love are one. Christ and light are one. We and Christ are one. We and light are then one with God. God is Light and Light is Love… God is Love. All I know is that His light is so bright that you can not see…and in Him is Pure love which brings so much peace there is noothing else but your own emotion of sheer joy. You lose yourself in Him and when God looks at us all He sees is His Son. As much as I’d like to reply, I can’t seem to do so. I’d be interested to know how many of these individuals who claim to have this Near Death Experience are Christians and how many aren’t. It seems to me that people experience kinda what they expect death to be like and nothing more, but I’m not sure they experience the real deal, merely a glimpse of what is yet to come when it is truly their time. I am currently writing a book about my NDE. I am also a health care provider 🙂 I like your site. Krista, that is so amazing! Please let me Know when it is finished as I’d love to be one of the first to read it! I have a passion 4 NDE’s! ← When Life Got Rough, God Lifted Me Up!